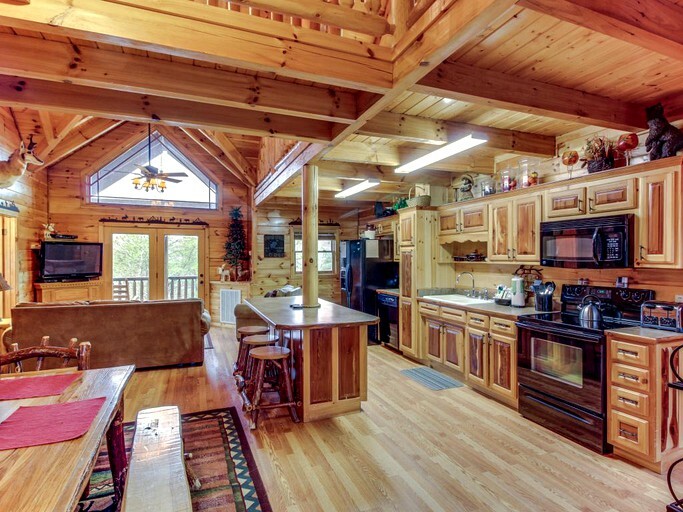 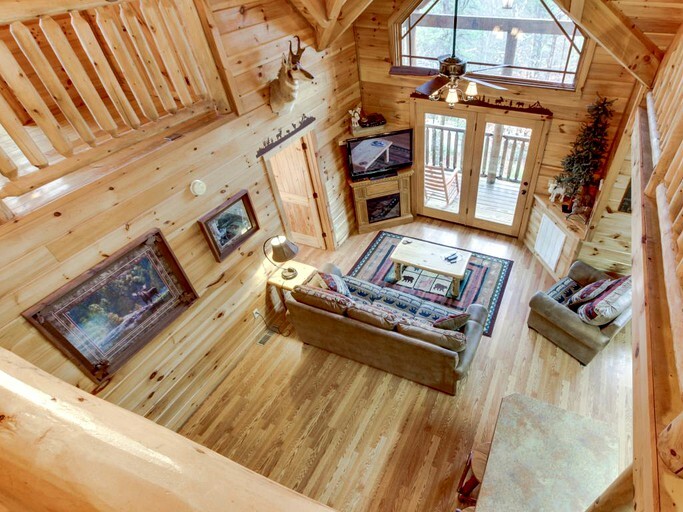 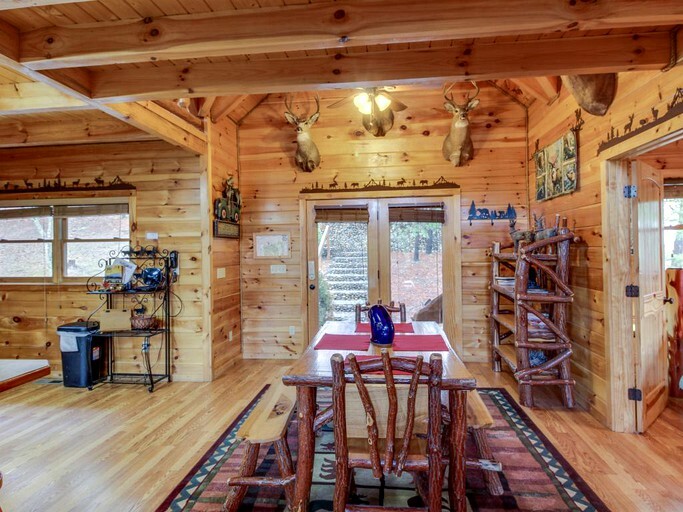 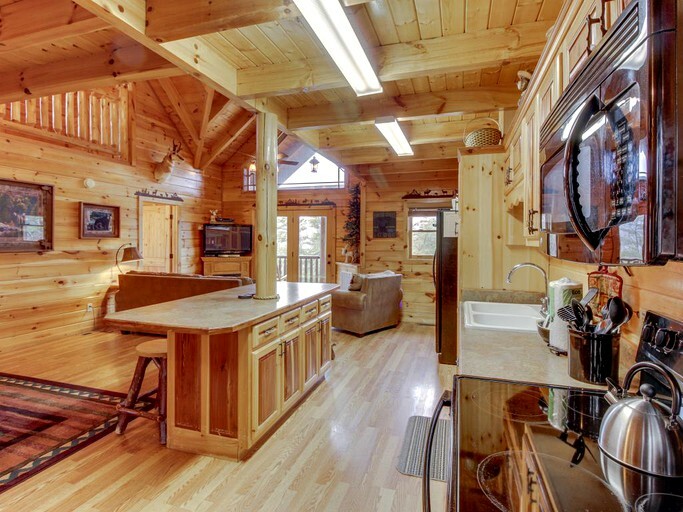 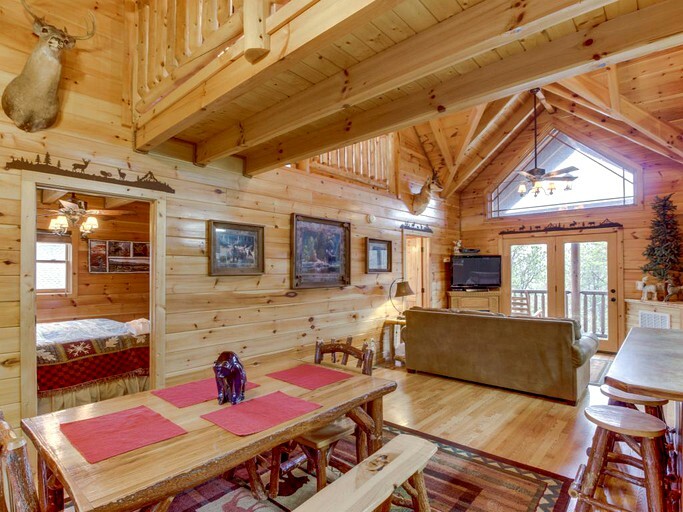 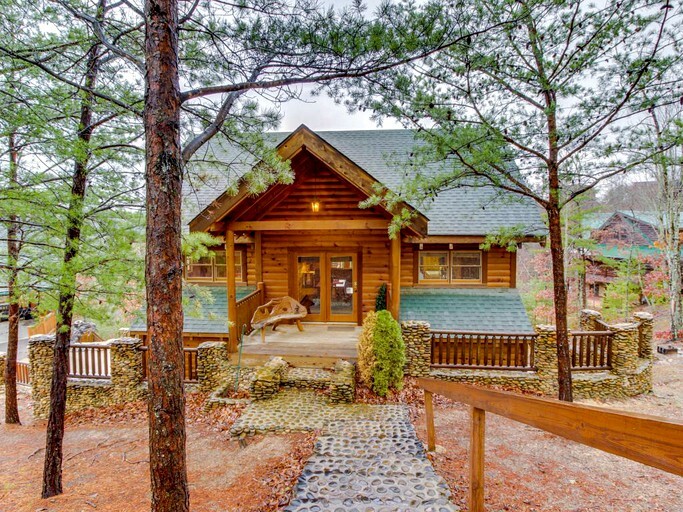 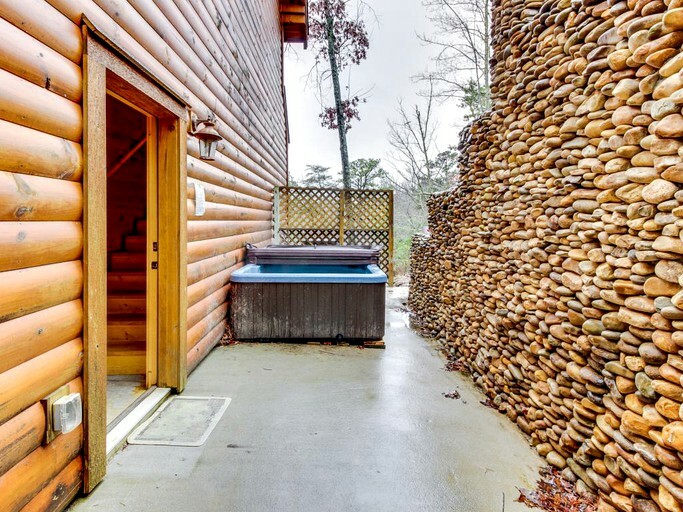 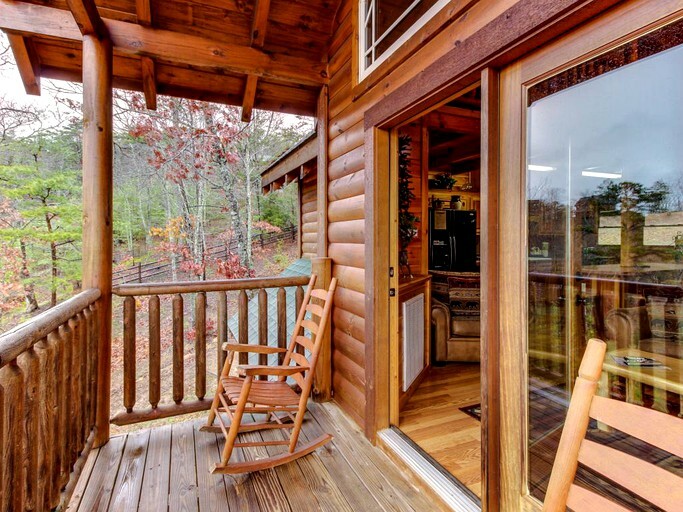 This luxurious wooden cabin near the Smoky Mountain National Park has one bedroom and two and a half bathrooms. 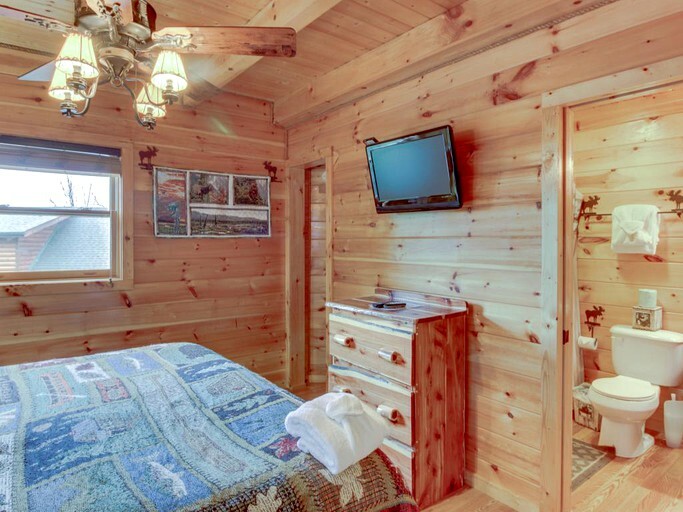 The ground floor master bedroom features a king bed, a wall-mounted flatscreen TV, and an ensuite bathroom. 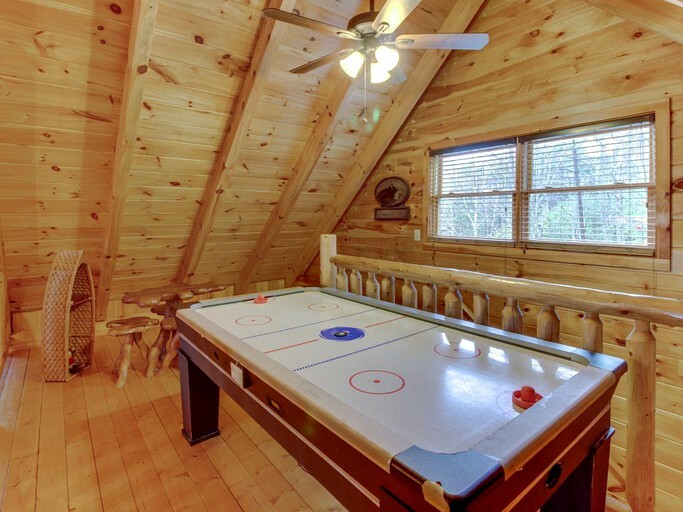 Upstairs the loft has a game room with an air hockey table. 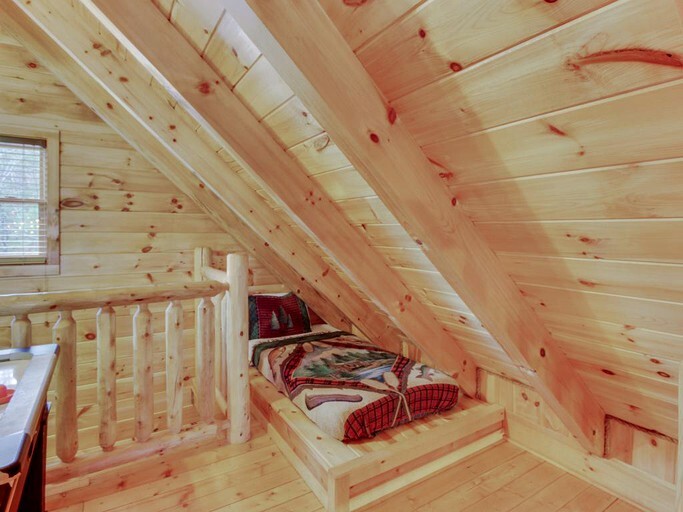 Across the catwalk is the second sleeping area. 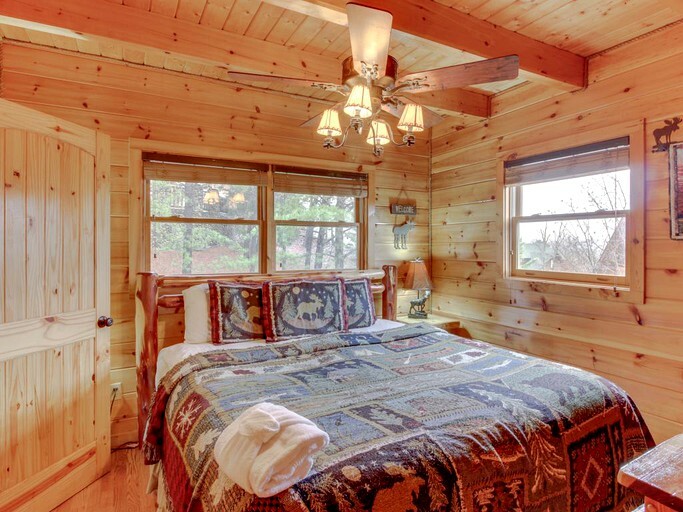 There is a queen-size bed, two built-in beds, and a full bathroom. 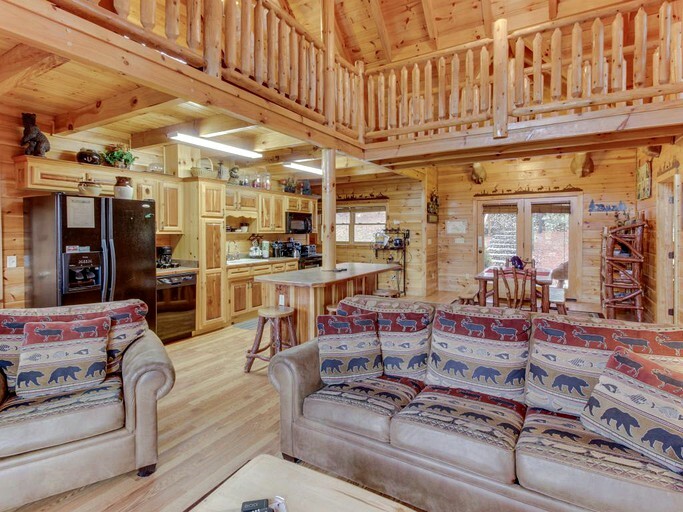 For additional guests, the living room couch pulls out into a queen-size sofa bed. 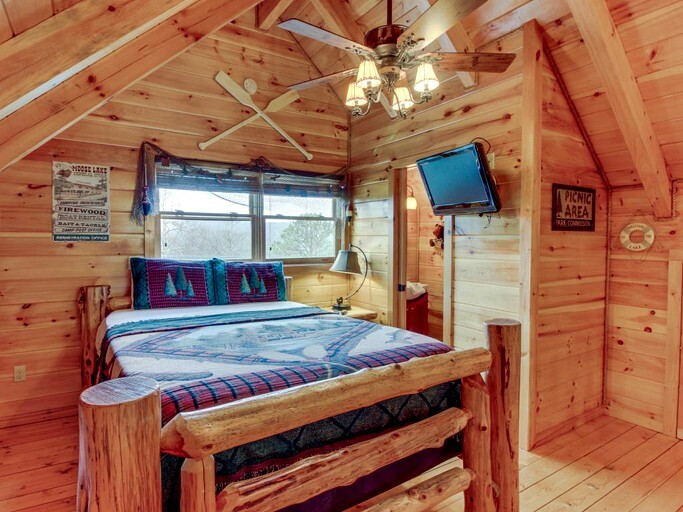 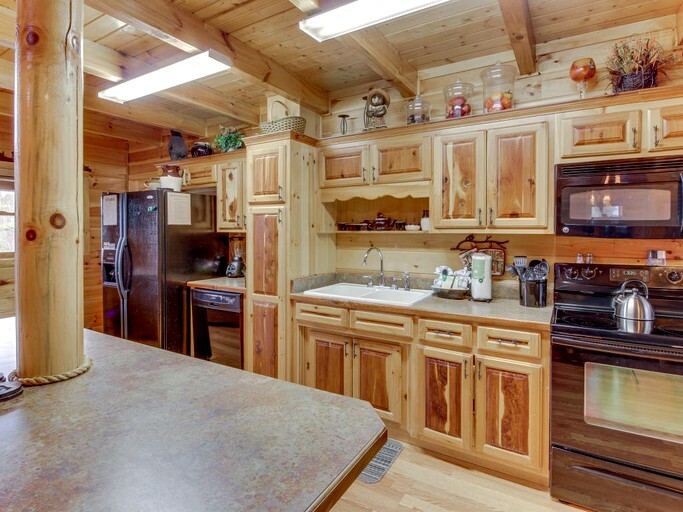 This recently constructed eight-person cabin has a private outdoor hot tub, outdoor fireplace and picnic area, an air hockey table, and a charcoal grill. 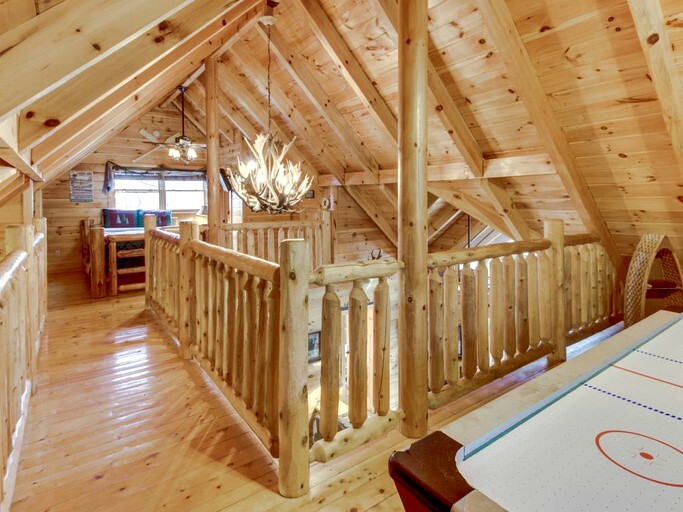 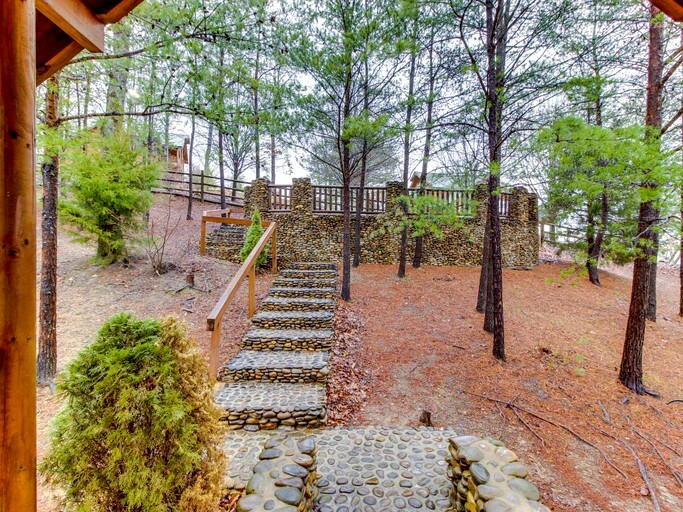 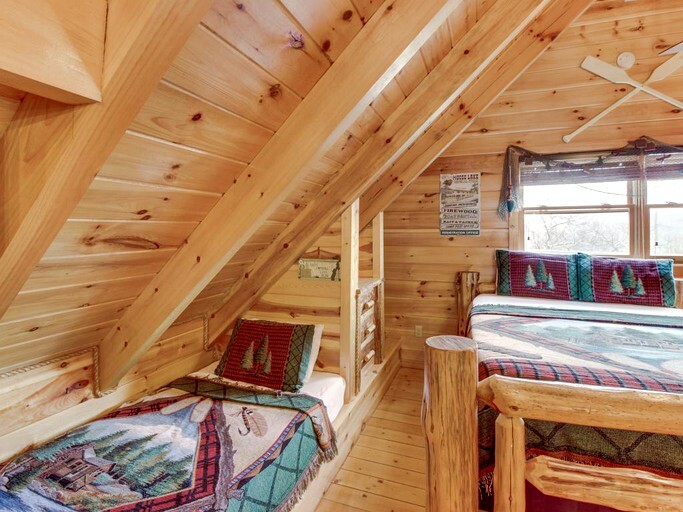 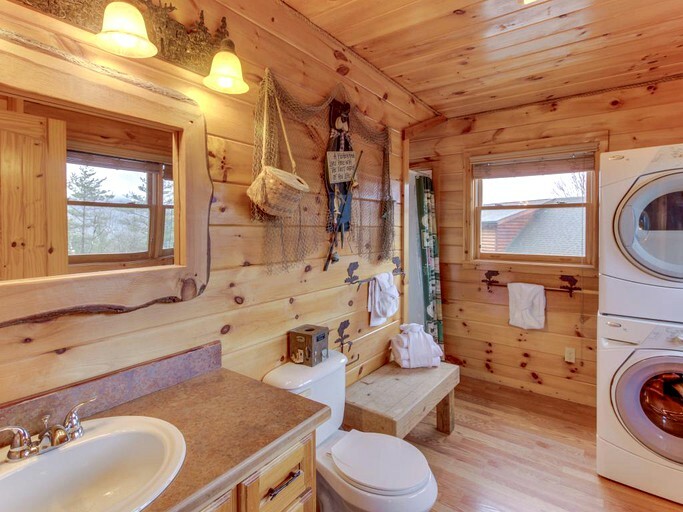 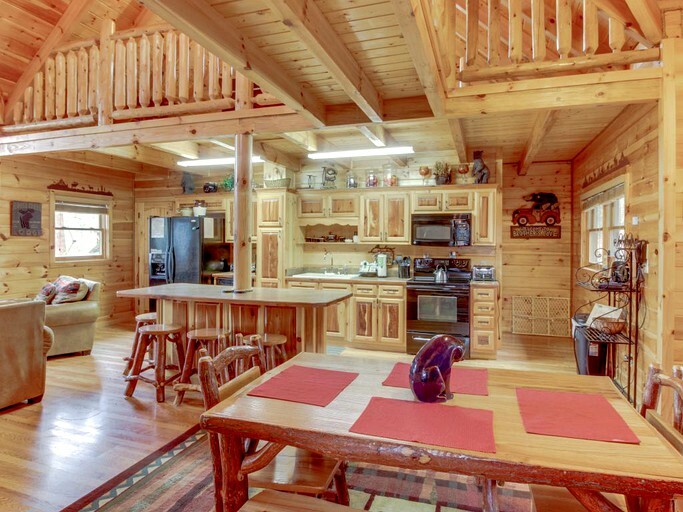 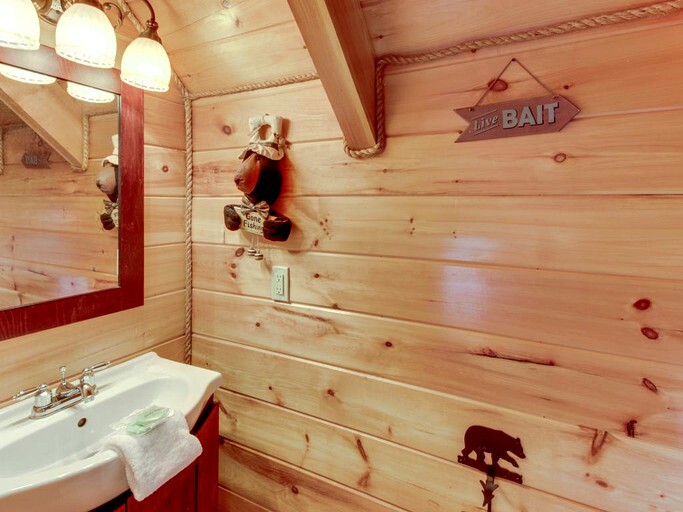 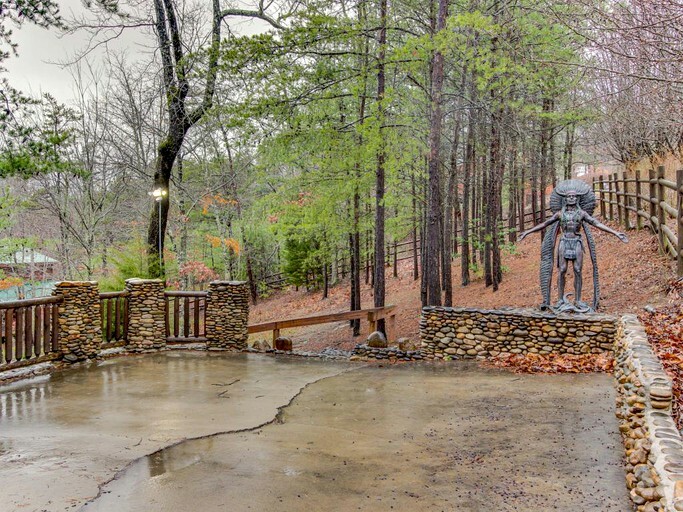 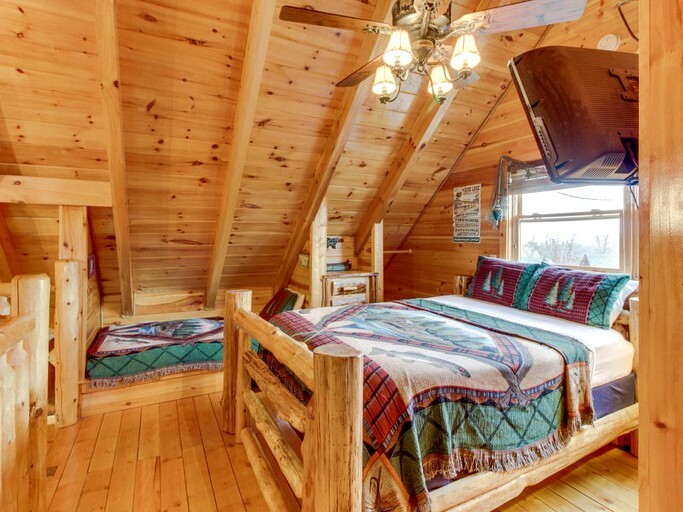 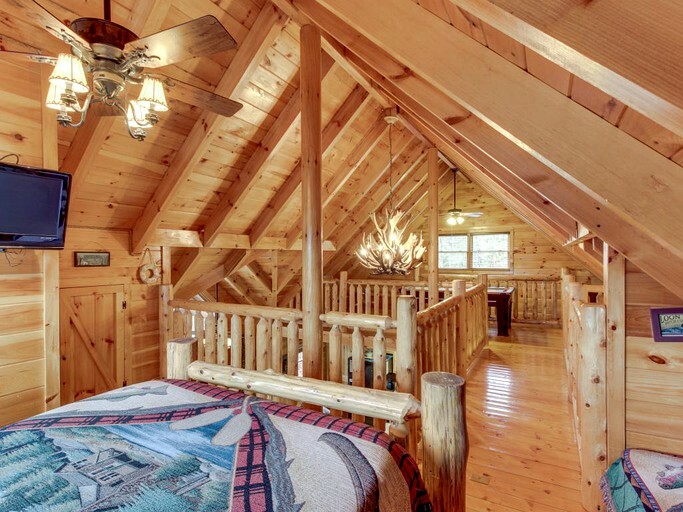 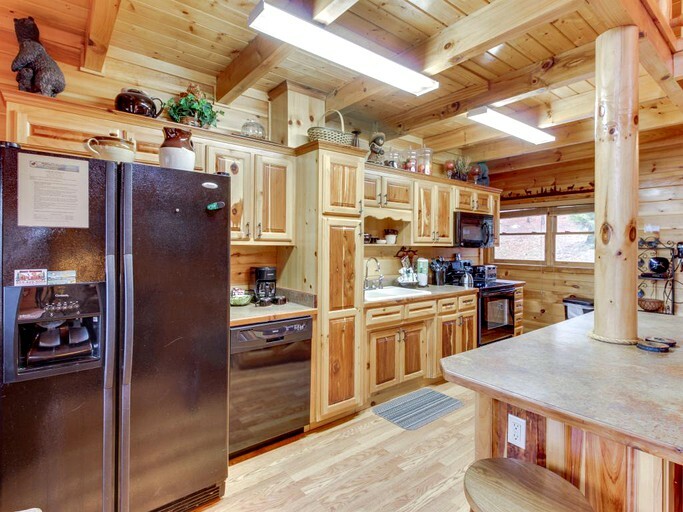 It also has traditional cabin decor and extensive stone work. 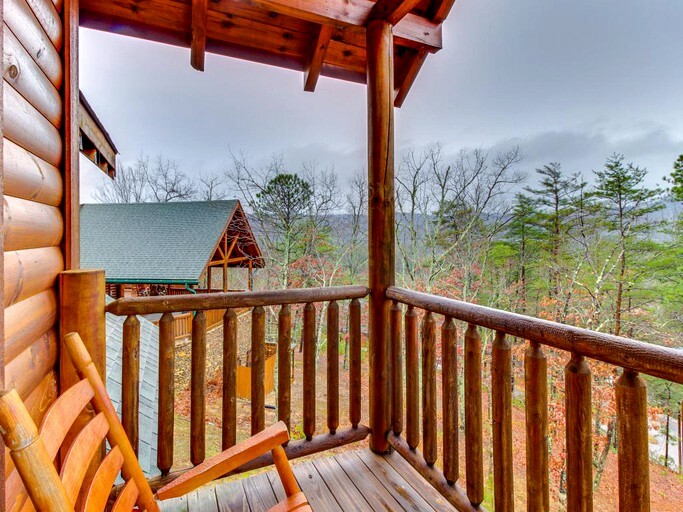 Guests can enjoy the rocking chairs on the deck and admire the stunning views of the Great Smoky Mountains. 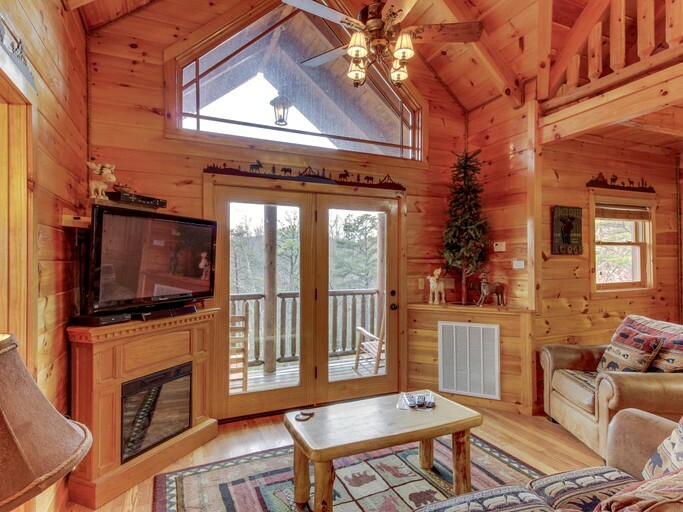 The living area has a flatscreen cable TV and glass double doors which allow in a lot of sunlight. 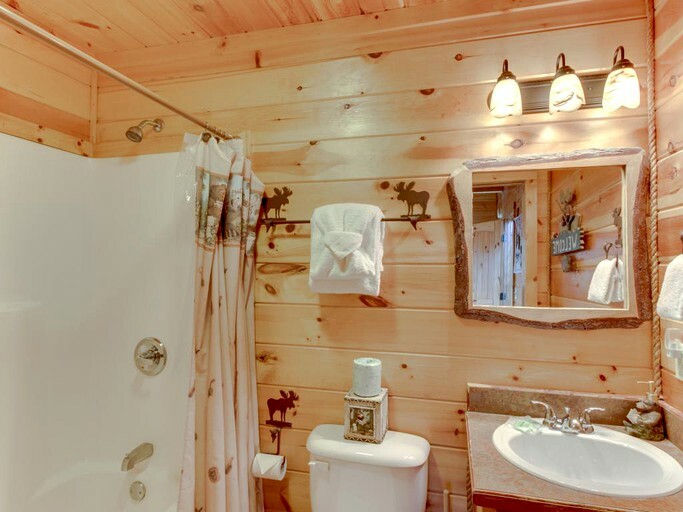 There are a washer and dryer on site for convenience. 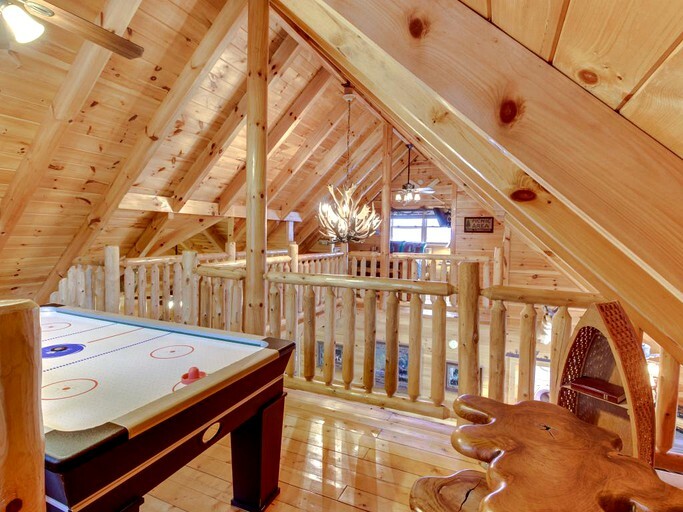 There is no shortage of family-friendly activities to choose from. 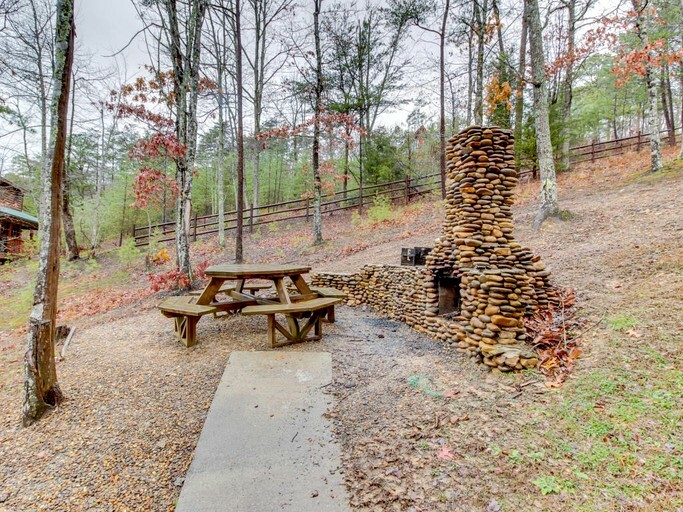 The Great Smoky Mountains National Park has miles of hiking and mountain biking. 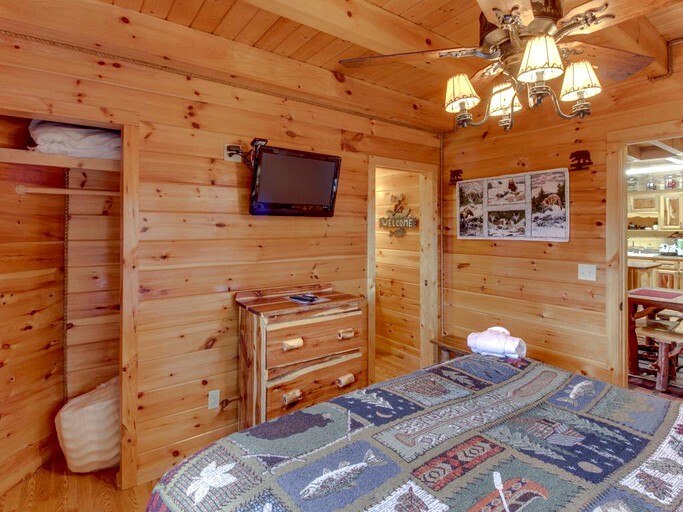 Dollywood amusement park is great for children and has games, rides, and food. 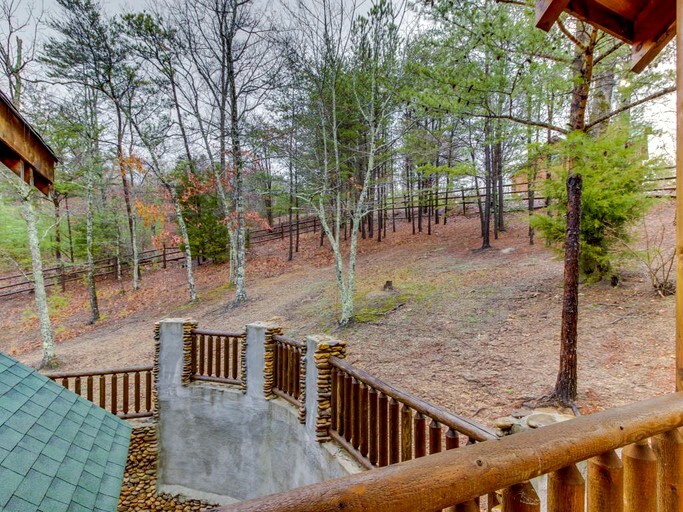 In Gatlinburg, there are golf courses with stunning views. 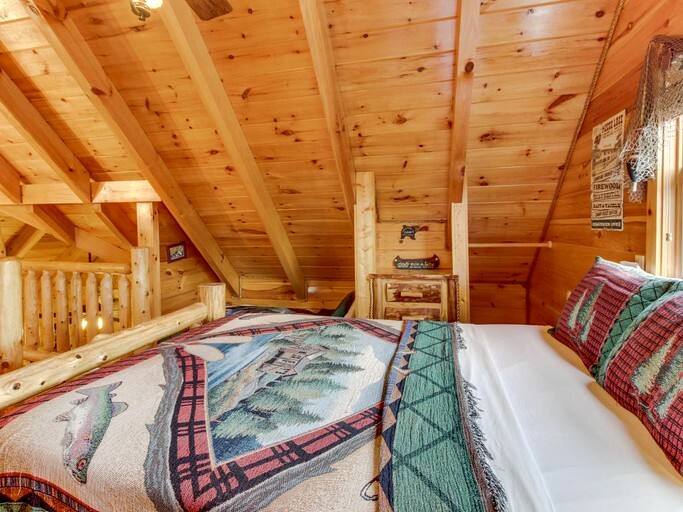 Glampers can get a real adrenaline rush by taking a helicopter tour or balloon tour of the luscious scenery and rolling mountains. 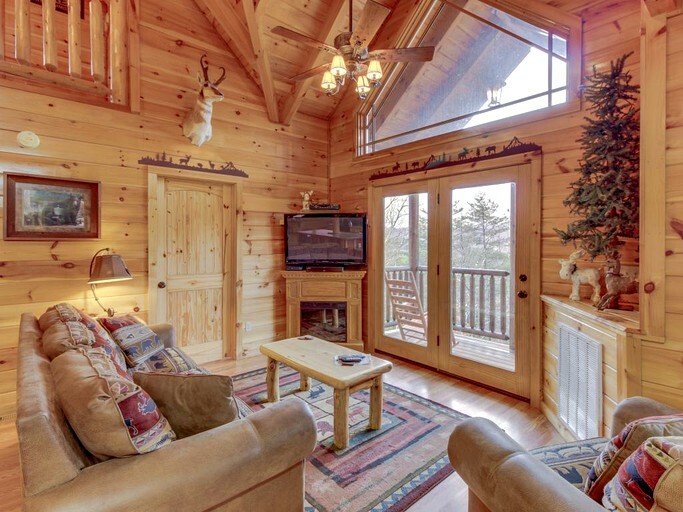 Enjoy a day of skiing or snowboarding during the winter at the Uber Gatlinburg Ski Area or during the warmer months take the aerial tramway to the top of the mountain for beautiful views of the valley below. 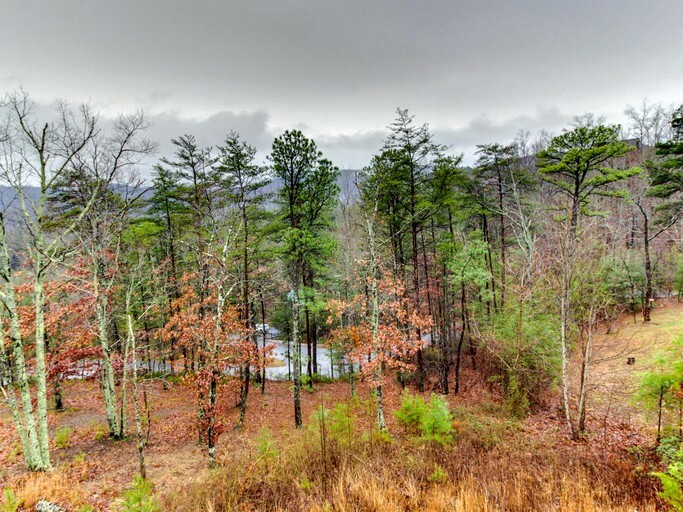 A visit to Cades Cove offers miles of hiking for all levels, smallmouth bass fishing, guided horseback riding, and even wildlife viewing. 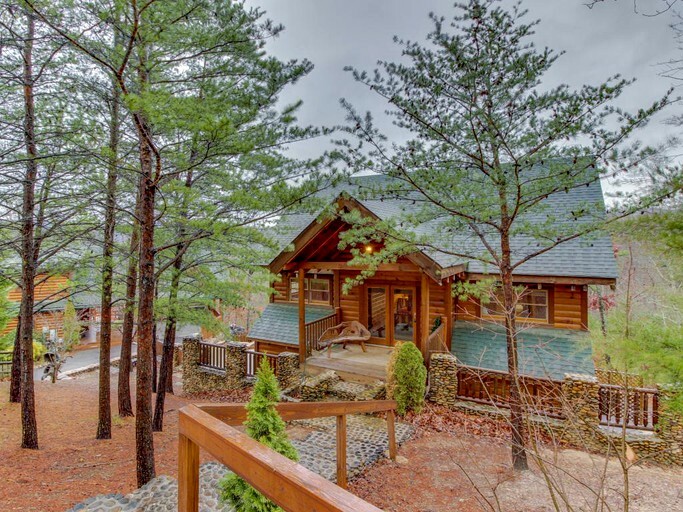 The town of Sevierville has outlets with over 120 high end, brand names stores and a variety of restaurants, galleries, specialty stores, and antique malls.